Incredible India is a niche to many national parks and sanctuaries. The country is enriched with the fantastic array of wildlife. 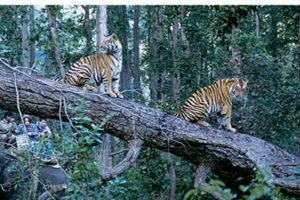 Tourists can experience the luxuriant jungle safaris and watch the tigers, elephants, rhinos, birds and many more in the wilderness. India wildlife tours combine incredible sceneries and amazing traditions. This intoxicating country will glaze your moments and leave you with remarkable memories. It is a charismatic country enriched with some of the richest biodiversity in the world. There are about 400 species of mammals, 1250 birds, 460 reptiles, 240 amphibians and 2550 fish – among the highest species count for any country. Visit to the jungle and experiencing the sound of a Panther snarling in the jungle, lions and tigers roar, and marvel at the graceful sight of Cranes and Flamingoes in flight around their nesting grounds in the wildlife sanctuaries in India will leave you spellbound. The trajectory of Indian Wildlife tour is very gigantic. 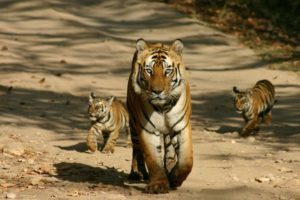 Some of the named and famed National Parks and sanctuaries of the country are Kanha National Park, Bandhavgarh National Park, Pench National Park, Satpura National Park, Sasan Gir Wildlife Sanctuary, Jim Corbett National Park, Kaziranaga National Park, Bandhavgarh National Park, Sunderbans Tiger Reserve, Ranthambore National Park etc. 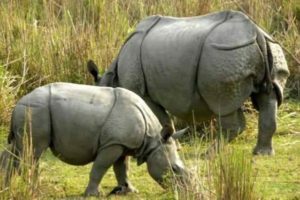 All these fanatical wildlife tours ensure the remarkable moments to the tourists and they can explore the unmatched combination of wildlife wilderness and nature beauty. This national park covers an area of 1945-sq-km which is comprised of a 900-sq-km core zone surrounded by a 1005-sq-km buffer zone. It is one of the largest national parks in India and the largest one in the central India. Some of the main species are Royal Bengal Tiger, leopards, the sloth bear, barasingha, and Indian wild dogs. Other commonly found animals in the park include the spotted deer, sambar, barking deer and the four horned deer. The verdant sal and bamboo forests, grassy meadows, and ravines make the visit of the tourists an unforgettable one. The niche for wilderness was established in the year 1936 as India’s first national park. Since the establishment, it is rated amongst the most excellent national parks of India. The park covers an area of 520.8 sq. km and is famous for its individualistic scenic beauty. This geographic region is surrounded by an array of wildlife with over 350 species of wild animals and 1200 species of birds. The flora and fauna enthralls the visitors and the picturesque surroundings of blossom green forests with the series of ridges running parallel to the valley gives the perfect experience of wilderness. The rare animals are Royal Bengal Tigers, one horned Indian rhinoceros, Snow leopard, Asiatic lion, and several varieties of exotic birds. This 2585-sq-km reserve is on the channels of world’s largest river delta. The tiger reserve showcases one of the wildest and strongest species of big cats- Royal Bengal Tigers. These tigers creep around and enjoy their way of living in the impenetrable depths of the mangrove forests and also have the fun of swimming in the delta’s immeasurable channels. Tourists can see the sights of 1412 sq km sanctuary and can explore the thrills of hilly forests. 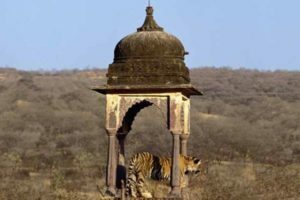 The Wildlife sanctuary is about halfway between Veraval and Junagadh. 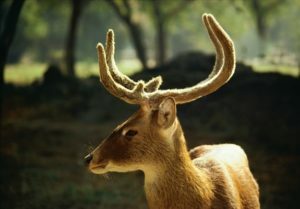 Tourists can spot the dainty chital (spotted deer), the sambar (a large deer), the nilgai or bluebull (a large antelope), the chousingha (four-horned antelope), the chinkara (a gazelle), crocodiles and rarely seen leopards. This place is also a great destination for birders too and the bird lovers can have the fun of watching over 300 species. The favorable time to visit the sanctuary is from November to April; the sanctuary is closed from 16 June to 15 October and possibly longer if there has been a heavy monsoon. Tourists can explore the exciting Sasan Gir with affordable and cost effective packages.